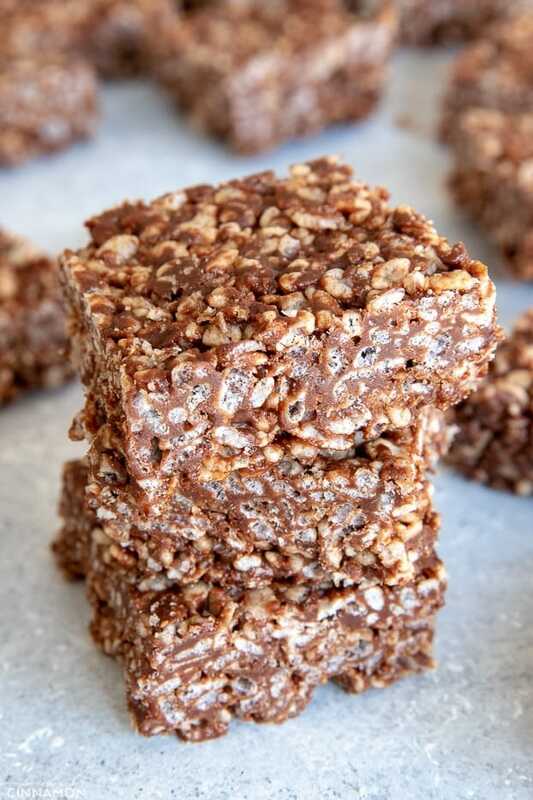 Super easy 4-ingredient rice krispies treats made with chocolate and peanut butter. 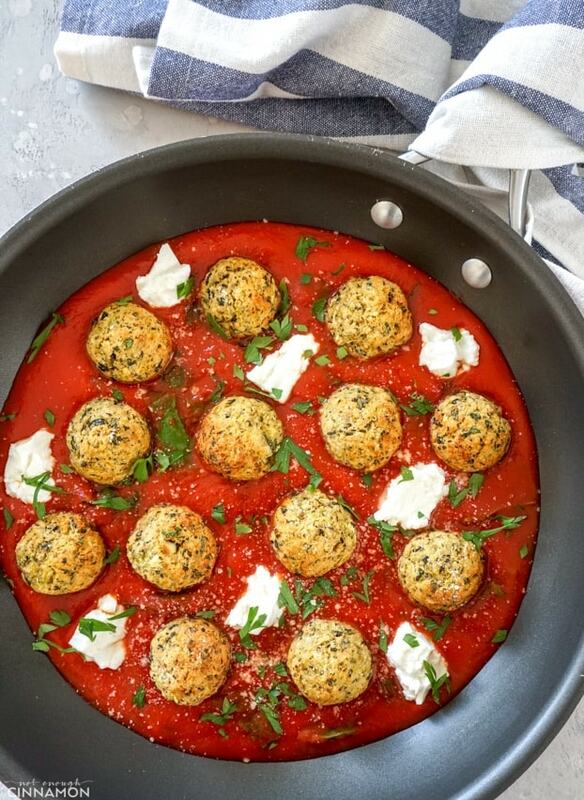 They are so delicious and a huge crowd-pleaser! And bonus point – they are much healthier than traditional rice krispies treats (less sugar, no butter, no marshmallow)! A friend of mine brought these to a dinner we were hosting and…I’m so grateful she did haha. It was the end of the meal, we were stuffed and yet, we all came back for seconds. And the leftovers she left were gone the next day (you can credit Solal my hubby for that). We all asked for the recipe and we’ve been making them on repeat since then – even the friends who don’t cook much. This should give you an idea of how freaking delicious these bars are. Honestly, they are addictive and it’s hard to stop at just one. Consider yourself warned! 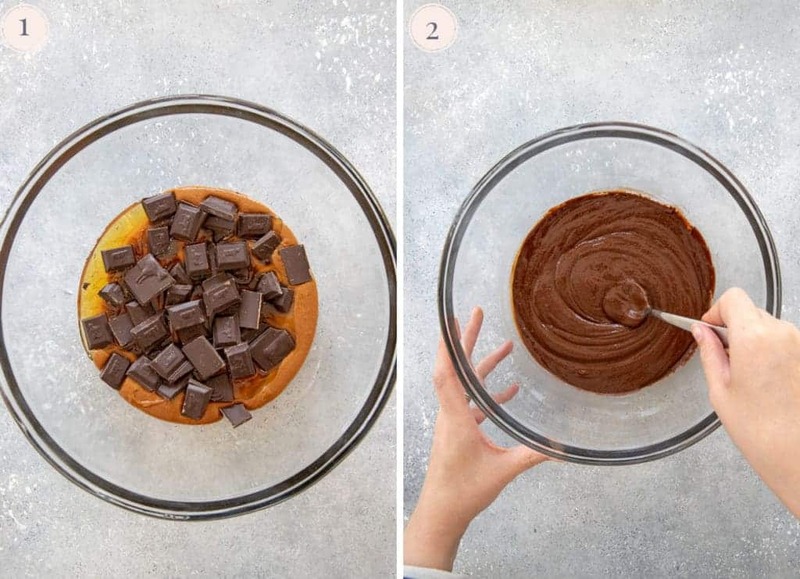 Step 1 – Place some chocolate (dark or semisweet, you choose! ), peanut butter and honey in a bowl large enough for all the puffed rice (so, a big one!) and microwave-safe. Step 2 – Microwave in 30-second bursts, stirring between each. When the chocolate is almost completely melted, remove it from the microwave and stir until smooth. Step 3 – Add the puffed rice cereal to the bowl. 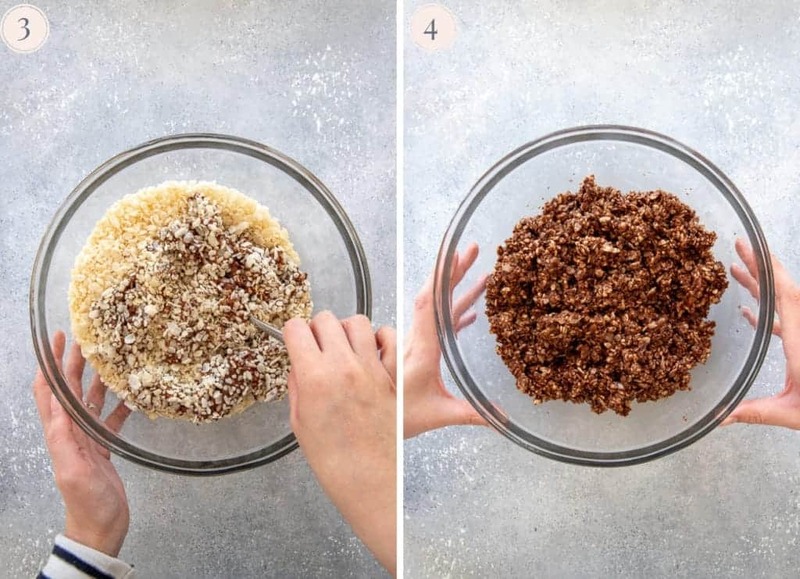 Step 4 – Mix, mix, mix until all the rice is covered with the chocolate mixture. Step 5 – Transfer the mixture to a large baking dish (9×13″ ideally). If you’re not using a glass or ceramic dish but a non-stick like me, you may want to line it with parchment paper so you don’t damage it when cutting into bars. Step 6 – Press as much as you can! 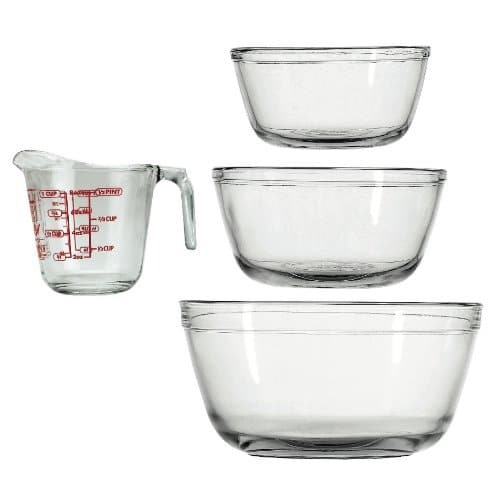 You can use the back of a spoon, or a tall glass, a measuring cup…anything with a flat bottom you can press on! Step 7 – Freeze for about one hour and they’re ready to be cut into bars and devoured! You can use your favorite chocolate: dark or semisweet (aka milk chocolate). You can also melt chocolate chips if that’s what you have on hand. Use different kinds of nut butters: I love them with lightly salted peanut butter but they’re delicious with almond butter too for instance. 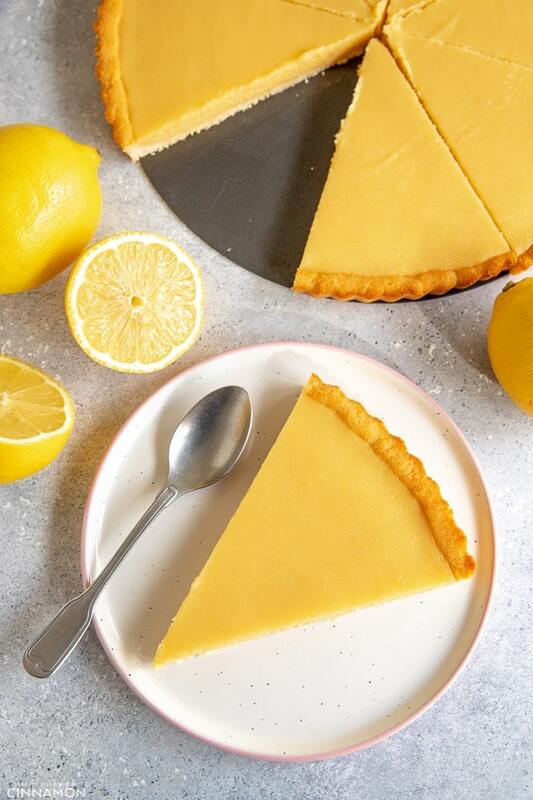 Cut them into different sizes depending on your needs: “classic” square (pictured) for a dessert or mini-bars for a potluck or party. See all the details below in the recipe box. Sorry but maple syrup won’t work here! Keep them in the freezer to make them extra firm (otherwise, in the fridge). Place chocolate, peanut butter and honey in a large microwave-safe bowl (make sure it'll be big enough for all the puffed rice later on). Microwave in 30-second bursts, stirring between each and watching carefully so that the chocolate does not burn. When the chocolate is almost completely melted, remove it from the microwave and stir until smooth. Stir in puffed rice and mix thoroughly until all the rice is covered with the chocolate mixture. 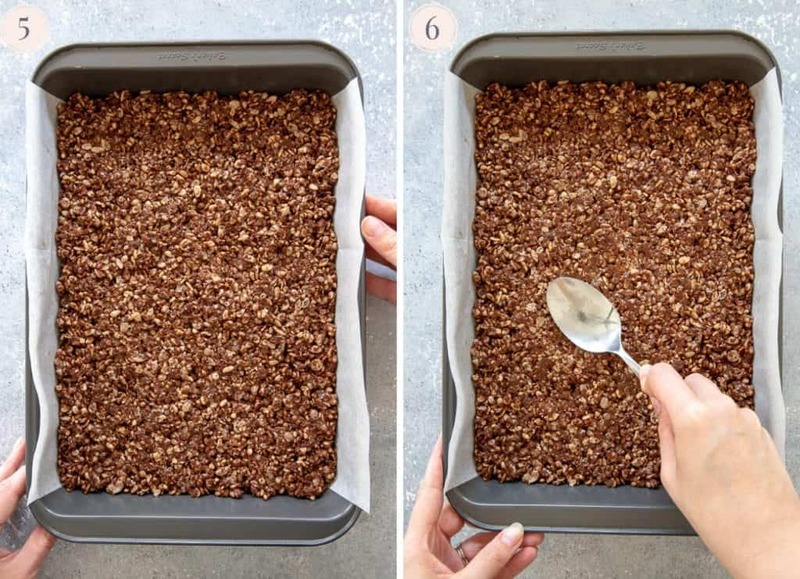 Transfer the mixture to a 9x13" baking dish, spread it evenly and press very firmly with the back of a spoon. 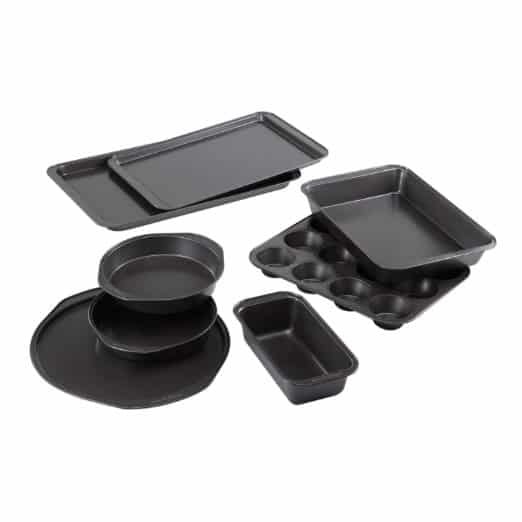 Note: If your baking dish is non-stick like mine, you may want to line it with parchment paper so you don't have to cut the squares directly in the dish and damage it. Place in the freeze for about an hour. Cut into squares and serve! You can either store the squares in the fridge or in the freezer if you prefer them extra firm (we love to keep ours in the freezer). They will keep for at least 10 days (they were all devoured beyond that). For a dessert, the ideal size is what's pictured. Cut them in 6 lengthwise (the long side) and 4 crosswise (the short side). This makes 24 bars. 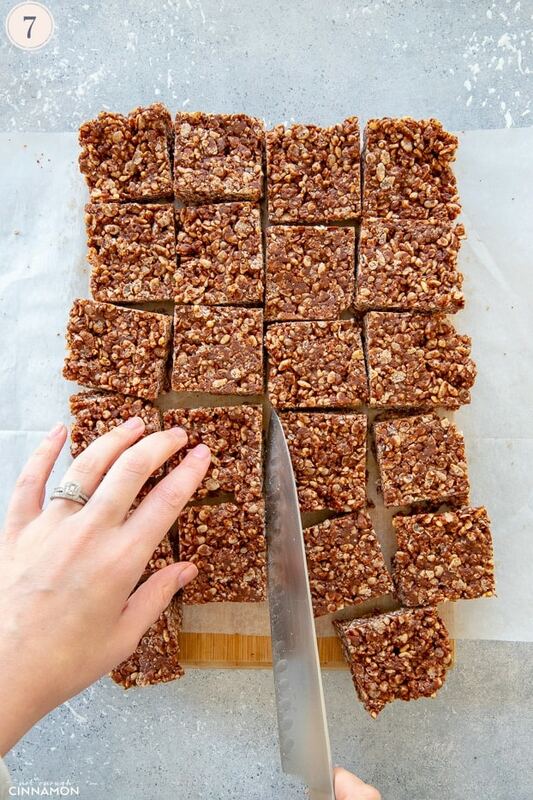 If you're bringing them to a potluck, party or if you're making them for yourself as a snack, I'd recommend cutting them in smaller pieces to make mini-bars. In that case, cut them in 8 lengthwise (the long side) and 6 crosswise (the short side). It makes 48 mini-bars. Can you use Rice Krispies® or Cocoa Krispies® cereals? In terms of texture, it would work perfectly, yes. 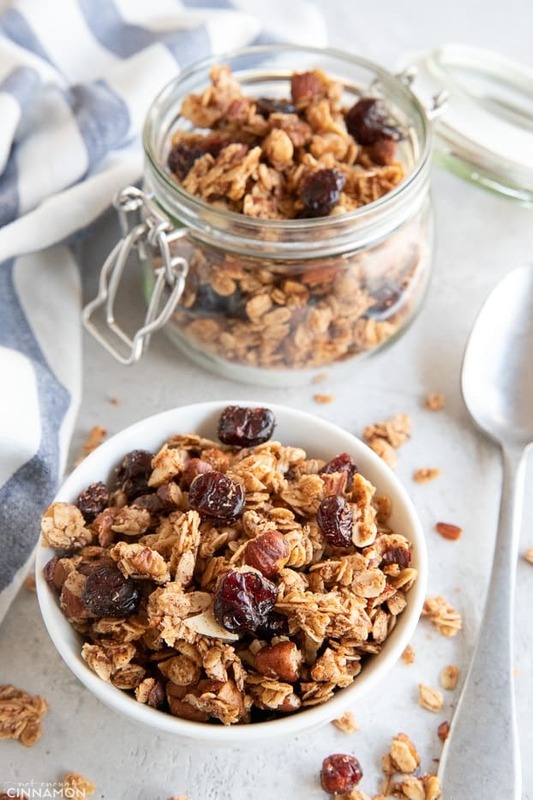 However, since I haven't tested it, I can't tell if it would be too sweet or not since these cereals are already sweetened (and reducing the amount of honey may compromise the texture and make them more crumbly). My guess is that it should be ok if you are used to sweet treats (since in the traditional recipe, we also add marshmallows) but you would need to test it yourself. If you do, let me know! Peanut butter: you can use your favorite nut butter. I tried with almond butter and it was delish. Honey: I wouldn't use anything else. Maple syrup wouldn't work here. Chocolate: you can use chocolate chips instead of a chocolate bar. 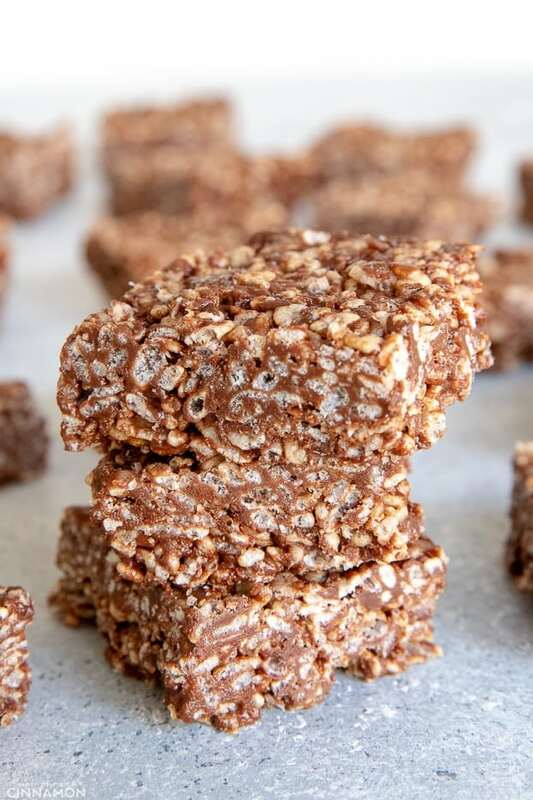 If you tried these chocolate rice krispies treats, don’t forget to rate the recipe below and let me know how it went in the comments – I love hearing from you! You can also follow me on Instagram, Pinterest and Facebook for more deliciousness and behind-the-scenes! Hi, these look yumm! my daughter is allergic to honey however, any other substitute please? Hi Andrea! Sorry to hear about your daughter’s allergy. Unfortunately honey is difficult to replace in this recipe because it acts both as a sweetener and a binder. The only other ingredient I could think of that might work is brown rice syrup (aka rice malt syrup) if that’s available where you live – but I haven’t tested the recipe with it so I can’t be sure. Wow! This is a recipe of my dreams! 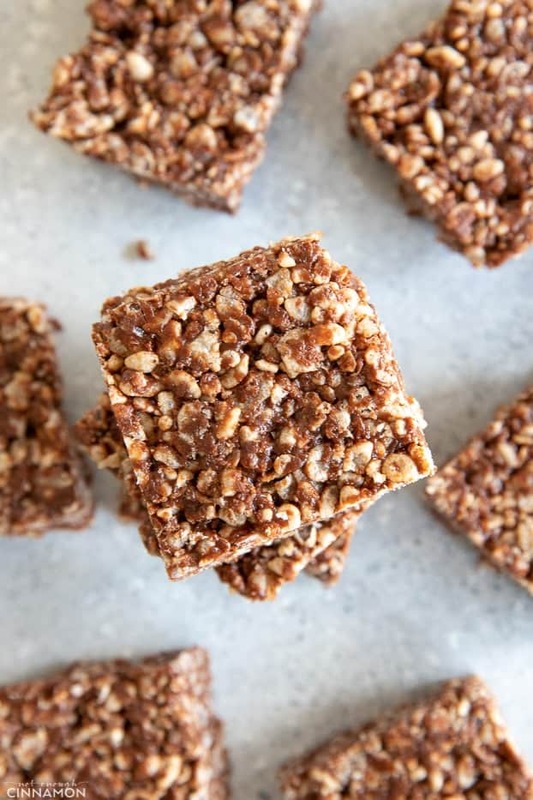 What a fantastic idea of bringing together peanut butter and chocolate with rice crispies! I bet they are quite addicting once you start to eat them too! Thanks Denise! It’s honestly hard to stop at one!! Oooh I love the addition of peanut butter! There’s something about Rice Krispie treats which is just so addictive, I love them and no matter how many times I make them I always want more!! These look fantastic! Peanut butter always and forever <3 lol I know exactly what you mean Annie, these little treats are addictive! Wow. These sound perfect and so easy. Can’t believe you only need four ingredients. Will be trying soon. These look so good! Totally making them today for my kids. I know they’ll be a huge hit! What a fantastic treat! Love the idea of the peanut butter in them too. Yum!